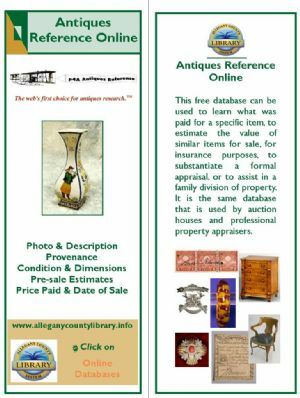 CUMBERLAND — Allegany County Library System has added the p4a Antique Reference database to its electronic collection, allowing patrons to identify and find market values for a wide variety of antiques. Users will also be able to see a picture with each entry. The p4a Antiques Reference database is used by antique dealers, museums, and leading personal property appraisers throughout the United States to evaluate a wide range of antiques. It is used routinely to estimate the value of similar items for sale or for purchase, for insurance purposes and to substantiate formal appraisals. The values given are based on prices from approximately 50 leading regional auction houses located throughout the United States and other selected specialist auctions. Items can be searched by keyword or the user can browse broad categories of items subdivided by type. Users have commented that the database is easy to use. The database can be used within any library branch or from the individual's home or office. Access to this database is made possible by Western Maryland Public Libraries. For more information, call (301) 724-1607 or visit www.alleganycountylibrary.info.